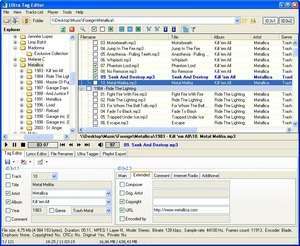 Ultra Tag Editor is a powerful and easy-to-use mp3 tag editor with many useful features. Program allows you to edit both ID3v1 and ID3v2 mp3 tags, rename tracks from tags, export a tracks information to HTML, MS Excel and CSV formats, generate M3U and PLS playlists, copy ID3v1 to ID3v2 tags and vice-versa. Ultra Tag Editor works with all existing tag formats: 1.0, 1. Ultra Tag Editor 2.4.4 is a shareware program and can be used as a demo to try the software until the free trial period has ended. A full version of the program is available after the trial period ends. For security reasons, you should also check out the Ultra Tag Editor download at LO4D.com which includes virus and malware tests. Additional screenshots of this application download may be available, too.